A Sarpanch is an elected head (In few cases selected head) of a village-level institution known as Gram Panchayat (Village governing Body/ Village Panchayat) in India. In general, new Sarpanch is elected after completion of every five years by all the people of the village. The Sarpanch, together with other elected members (Panchs), constitute the Gram Panchayat. The Sarpanch is the focal point of contact between government officers and the village community. Gram Panchayat is one of the oldest forms of Village governing body in India. Before there were only five members in Village Panchayat. Sar, meaning head and panch meaning five, gives the meaning head of the five decision makers of the gram panchayat of the village. Now the number of the members depends on the population of Village. 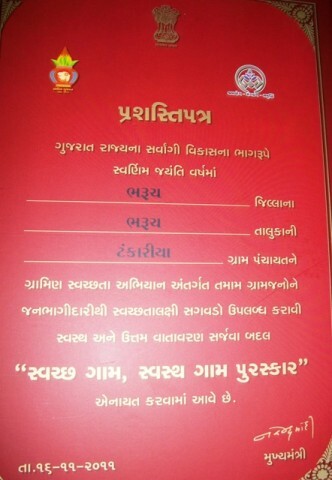 Tankaria Panchayat got Award for the Second Rank in the Bharuch Taluka. Date:16/11/2011. 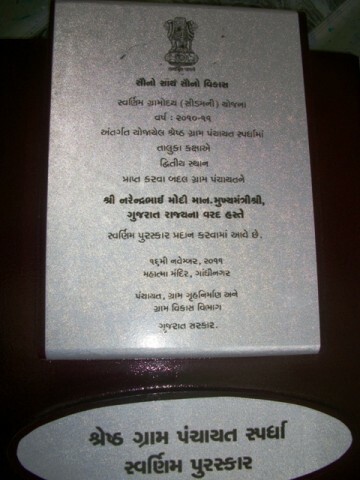 Tankaria Panchayat got “Clean Village, Healthy Village Award” and Rupees 200000/ Cash on 16/11/2011.